Stay healthy and stay informed. ▪ Map out your destination and begin with a short hike. ▪ Never hike alone and check in with the park ranger when possible, sticking to your planned itinerary. Trail maps are often available and a great resource for distance, terrain, elevation, trail markers and types of nature you may encounter. ▪ Always check the weather report before your hike. ▪ Know the animals, insects and plants indigenous to your surroundings to avoid bites, stings, or rashes as you enjoy nature. ▪ Prepare a first aid kit that will provide immediate attention to sunburn, bug bites, blisters, poison plants, or injuries due to slips or falls. ▪ Wear well worn hiking boots or supportive shoes that have been broken in weeks prior. Socks should be made of wick moisture to keep feet dry. ▪ A lightweight backpack should contain sunscreen, water, sports drinks, salty food, snacks, a small whistle, compass, and a flashlight. ▪ Layer your clothing and wear a hat to shield your head and face from the sun. ▪ Keep an efficient pace. You should be able to talk and hike at the same time. A good rule of thumb is to cover one to two miles per hour. 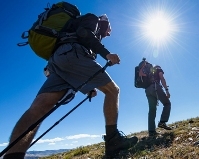 ▪ Know the signs of exhaustion, dehydration, altitude sickness and how to treat these. ▪ Take time to rest and replenish your body with fluid and food. Drink 8 to 12 ounces of fluid per hour. ▪ Know your physical abilities and those of the people hiking with you. ▪ Hike sober – alcohol and drugs can change your reaction time and cause injury. Advanced preparation is the key to an enjoyable hike. Be aware of your surroundings at all times, the terrain you are hiking, changes in weather, and your overall condition and energy level while hiking and seek medical attention when necessary..